← our old house tour continues. This week I’m on the our old house train and jogging down memory lane thinking about all the work we did in that old place. This is the back door of the house. You walk out into the back yard and a very, very sketchy “patio”. We let our dogs in and out here, which worked really well for us. Because of the location of the door, a lot of dirt, mud, grass, leaves, etc. 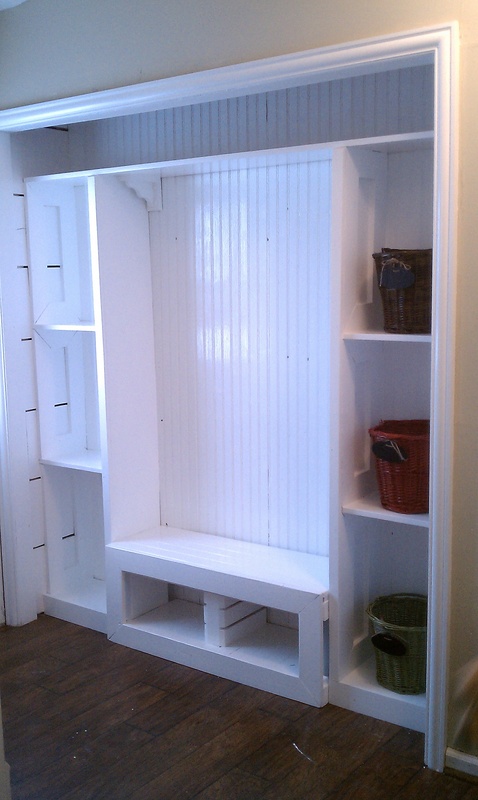 got tracked into the house, so Tommy decided to tackle one of my favorite projects and built us a mudroom! Yep, this was our back door in all its glory. 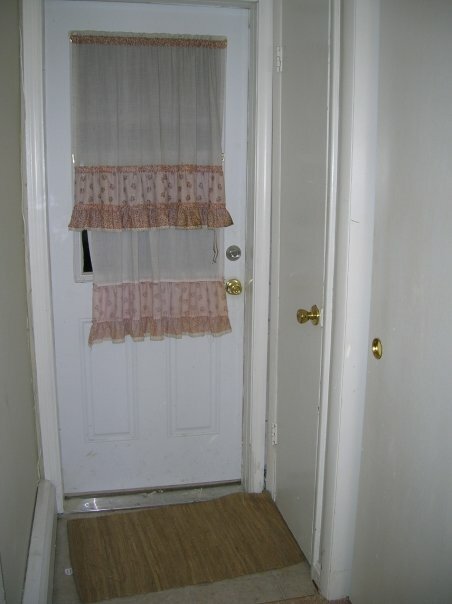 Look at those lovely curtains and the mismatched silver and gold door latches — breathtaking. Classy, people. Classy. Anyway… You can barely tell here but when we bought the house there was carpet in this hallway and all downstairs actually. We ripped the carpet in the hallway up and installed some really pretty Pergo flooring which classed things up a bit. 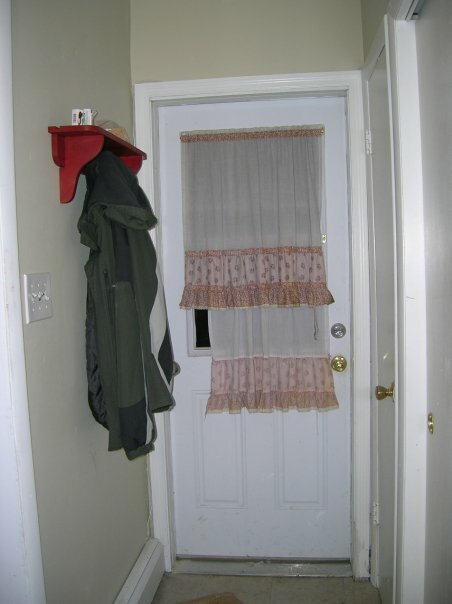 Notice the closet doors on the right. The first closet was very small. It had shelves in it but was really not a practical space to us. The second closet [closer to us in the picture] was much bigger. It had 2 sliding doors and long shelving. I’m sure some people would love closet space like that but it felt closed-off, cluttered, and impractical for us. So we demo-ed the closets! We ripped out everything. 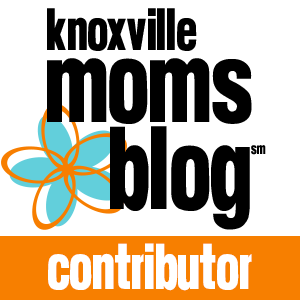 The doors, the wall between the 2 closets, those door frames, all of it– gone, gone, gone! And it really opened up this space like crazy. 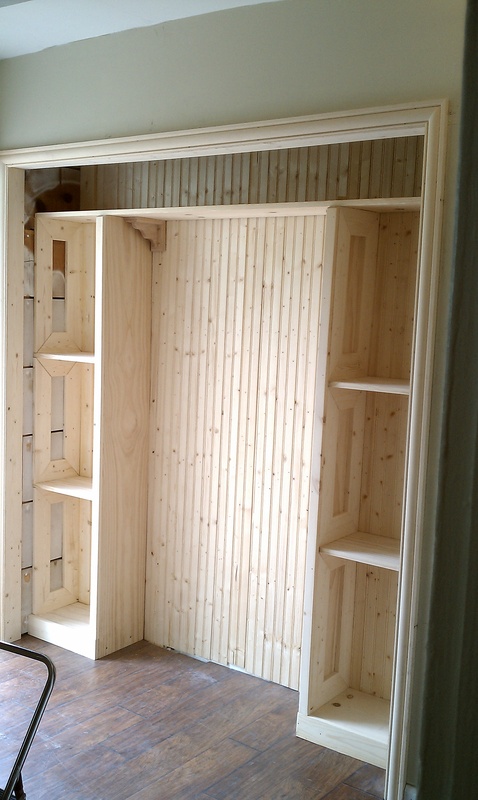 Next step, Tommy got to building a custom mudroom. 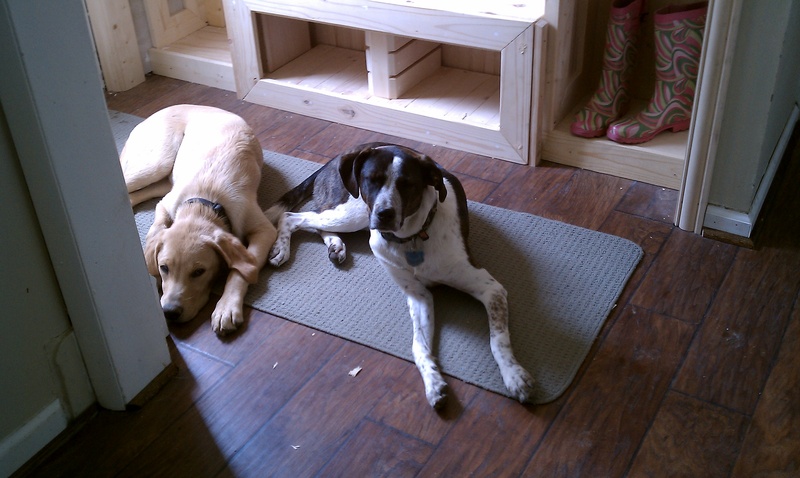 The pups chillin by the work-in-progress mudroom. Here Tommy had the wood all in, including the bench [which he also built]. This was before the bench went in. He built every piece of this and it could not have been more beautiful.